Our product range includes a wide range of resin bonded diamond wheels. 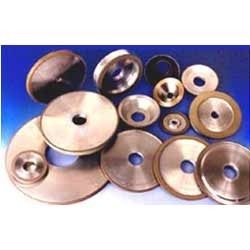 Our organization is instrumental in offering an excellent range of Resin Bonded Diamond Wheels which offers self- sharpening effect and even grit distribution, the offered diamond wheels are preferred to be use on use on carbide, glass, welds, quartz. Our diamond wheels are manufactured with finest grade material and leading technology under the direction of our skilled professionals.